An innovative website named My Portfolio Wizard along with its founder, Bruce Lange, has seen the growing need for a revolutionary financial advisory service due to the rapidly changing world of investment. This website has recognized the need to move from a paternalistic approach to a more self-directed approach when it comes to the field of banking, investing, and treasury. My Portfolio Wizard is a website whose creation is dedicated to empowering individuals with the information on financial advice that is needed to meet the needs of today’s world. 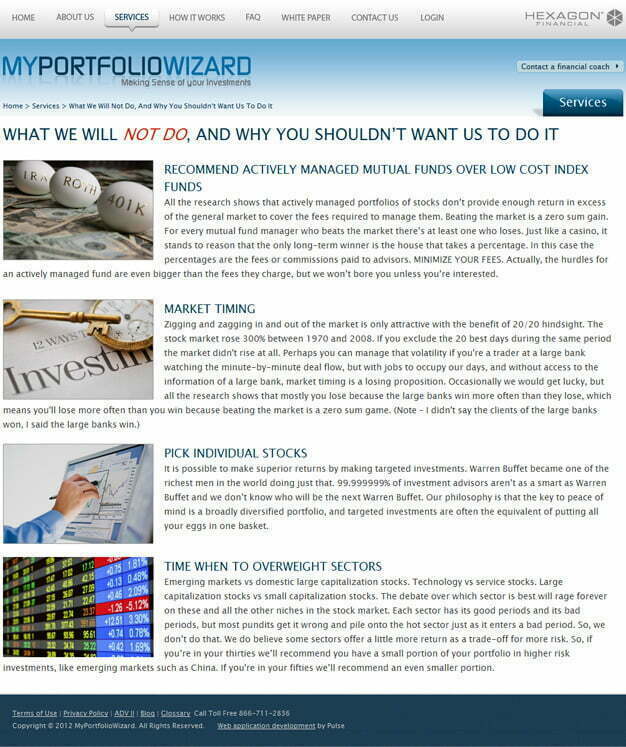 www.myportfoliowizard.com provides customized investment advice for an affordable fee, that is without conflicts of interest from commission or proprietary products, and combines all your household assets into an allocation plan. This website offers specific investment recommendations tailored to your household’s personal portfolio of assets. You are then presented with an allocated plan, and recommended as to what investments you should make in which accounts. My Portfolio Wizard needed a clean and sophisticated approach to their website. It had to be comprehensive and user-friendly with simple navigation so that the user would easily receive information and advice on making sense of his investments. The layout had to be concise and effective in its approach to a revolutionary investment advisory service. The website was designed using .Net/SQL as the backend, and as a result My Portfolio Wizard has a friendlier user interface. Pulse Solutions has also ensured that the website design displays information and website services in a comprehensive and concise manner. The outcome of the website is very near perfect, and helps the user to feel excited about getting started with making their own customized investment plans.